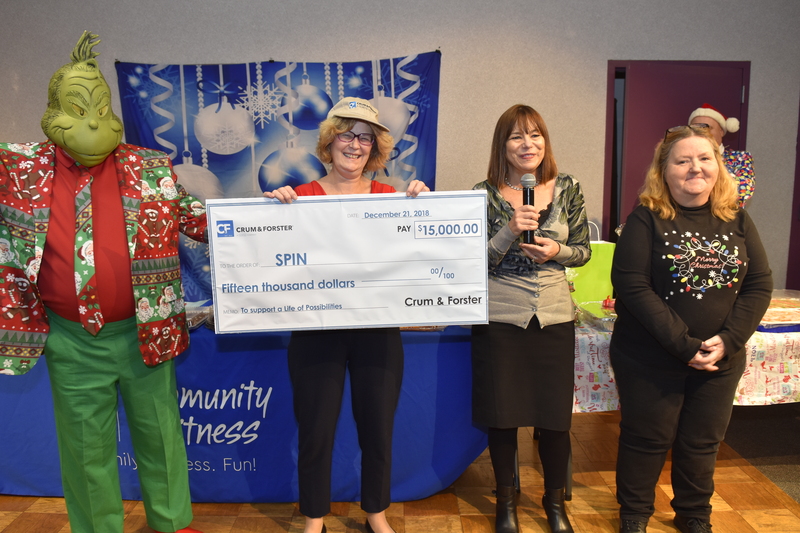 PHILADELPHIA (December 21, 2018) – SPIN hosted its annual Holiday Food Auction to raise funds for the people with autism and intellectual disability, as well as early childhood education programs. To open the event and spread holiday cheer, Crum & Forster (C&F) one of the country’s oldest insurance company’s announced a $15,000 donation to support SPIN and its mission to provide a life of possibilities for the people SPIN serves. Crum & Forster presented Kathy McHale, President & CEO of SPIN with an oversized check, and opened the auction with the opening bid. The annual Holiday Food Auction is a fundraiser where homemade and sought after food items are donated, auctioned off and awarded to the highest bidder. Nearly 200 guests are in attendance each year including community members, employees and adults with autism and disability supported by SPIN. In addition to enjoying the auction, the crowd gets in the holiday spirit with holiday jokes, a rowdy auctioneer, and an appearance by the Grinch.